The Brick Castle: HARIBO Christmas Sweets Bundle Giveaway!! This Christmas will be a happy one for HARIBO lovers as the treats giant have released a selection of special Christmas themed treats for your children - and lets face, for you! Even better, HARIBO have put together a cracking bundle for me to give away to one of my readers! The HARIBO Share The Fun Tub has all of HARIBO's most popular gums and jellies in one tub - bringing Starmix, Tangfastics and Super Mix together - no more having to choose - you can have them all! 720g divided into 24 mini treat bags to keep everything fresh until you're ready. 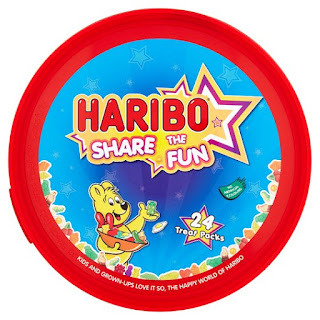 HARIBO Starmix Gift Tubes are the perfect stockingfiller, and we may just have some already deposited with Santa for our lot...120g of Starmix - enough to keep any child happy for a while! 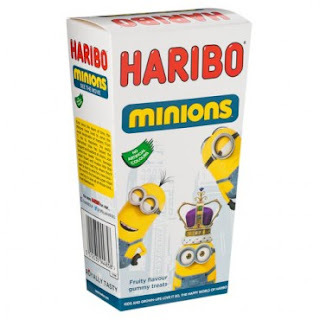 The HARIBO Minions Gift Box is packed with Minions shaped sweets in apple, raspberry, strawberry, cherry and blueberry flavours - my young lads think these are really special! 150g of blue and yellow foam and jelly treats. 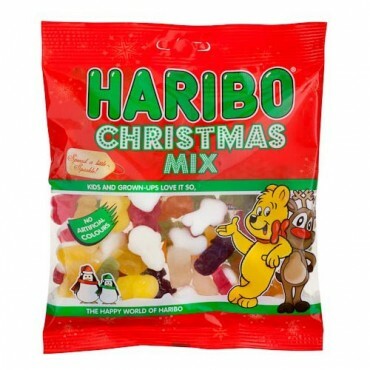 HARIBO Christmas Mix is one we haven't yet tried here - and a very special addition. Christmas shaped sweeties! As if sweets weren't enough of a treat - now they come shaped as reindeer, crackers, snowmen and Christmas trees. What could be better for your Christmas excitement and indulgence than 200g of totally festive treats. Haribo want one of my readers to have a very happy Christmas indeed and are offering a bundle of everything I've listed above for one winner. Entry to the giveaway is by Gleam form, and the giveaway will end at midnight on Sunday 13th December so that the winner can have their prize in time for Christmas. Open to UK entrants only, please see the terms and conditions at the bottom of the Gleam form. Prosecco, lots of cheese and champagne truffles! mine has to be minced pies, some kind of festive coffee or hot chocolate - I'm not loyal to a particular one, as long as it's festive! and some kind of chocolate to eat in front of xmas movies. And of course the roast xmas dinner! Quality Street, Terry's Orange & Haribo! ooh Stilton,Baileys and a tin of Quality Street! I love shortbread biscuits, chocolate and homemade Christmas cake. Sounds like the perfect festive combination. after eight mints, quality street and a terrys chocolate orange. Twiglets (from a tub), a nice glass of fizz (Christmas morning) and a baileys before bed Christmas Eve!!!!! Baileys, Cheese and Christmas Pudding! Turkish delight, quality street and pigs in blankets! Cheeselets, Gingerbread Cookies and Hot Chocolate! Satsumas and Brazil nuts always make me think of Christmas. They're simple, but I wouldn't want Christmas without them. Oh, and predictably, chocolate makes up the third item on my list. I'm sure I'm not the only one there. Haribo fried eggs, terry chocolate orange and chocolate truffles. Christmas cake, roasted peanuts and lots of sweets! After Eights, stollen and mince pies! Mince pies, christmas cake, trifle. A glass of bubbly, some Guylian chocolates and some salted cashews! Cheese, brazil nuts and praline chocolates. Chilled prosecco, fried eggs haribo and Doctor Who christmas special ... oh and the kids of course! Bottle of bubbly for my Xmas morning Buck's Fizz, ferrero rocher chocolates and my litre bottle of Baileys hic! After Eights, cheese and nuts! Matchmakers, Elizabeth Shaw's and homemade rum truffles. A tin of shortbread, a tin of roses chocolates and some nuts. Trifle, quality streets & cider! Nuts, After Eights, Jelly fruit slices - so nice for decorating a lemon cake. We don't like Christmas cake. Bailey's, mince pies & cheese! Hot chocolate, candles, Christmas dvds! Roses chocolates, after eight mints and a snowball with a cherry. Christmas cake - with marzipan, Christmas pudding with cream and chestnuts! Mince pies, hot chocolate and pigs in blankets! Chocolate orange, pork pie , black pudding. Cadbury's Chocolate, Cheese and Pigs in Blankets!